Nope, I do not know a thing about diet pills with ephedra. And am also not really an expert when it comes to candy treats. I am not even a fan of gummy bears for that matter. 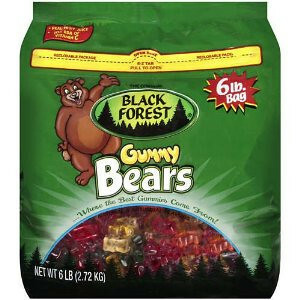 Which is why Black Forest Gummy Bears are really good because they got me hooked! I especially love the red color ones. Unfortunately, our house is being raided by ants so we had to repackage our gummies and I already threw away the wrapper so I can't tell what particular flavors there are. I also can't say just how much calories these pack. I'd still recommend them as a better alternative to hard candy, which is more acidic and thus more damaging to the teeth. One last thing, maybe it's because my son doesn't chew it well or maybe because it's really made from real gelatin... but I have also noticed that my son will skip a bowel movement after eating some. He doesn't get constipated exactly because he does manage to poop the following day. But i'd still go easy with this on toddlers like him. And definitely, it is a choking hazard to anyone younger than 1.5 years, I think.